Did you know that you can use essential oils to transfer prints from a laser printer or copier onto fabric, wood, or other materials? This easy method is a lot of fun and opens up many possibilities for personalized gifts with a really neat effect! We are going to show you how to do it with a fun popsicle stick puzzle that makes a great gift for kids. The trickiest part of this craft is getting a picture that will work. The pictures that work best are ones that have high contrast (like the picture we used of Roman chamomile flowers). Black and white images tend to have higher contrast than colored images, but you can still do this project with colored ink. High contrast means there is a very distinct difference between the blacks and the whites (or between dark colors and light colors). Pictures that have lots of different shades of grays (rather than pure black and white) or pictures with faint gradients may appear too faded and could be hard to figure out what the picture is. Keep in mind that the image will fade a bit during the transfer. Solid text also looks great, but you do want to make sure you flip the text before printing so it is readable after it is transferred. Use a program like Microsoft Paint or Photoshop to lay out your words or design. When you have the design looking how you want it, select the design, and use the program’s flip or rotate tools to flip the design horizontally so you have a mirror-image of the design. Print the design onto normal copier paper using a laser printer (or copy it on a toner-based copier). Another important note: Be certain your printer or copier uses toner. This method doesn’t work with inkjet or wax systems. Once you have an image printed on a laser printer, the rest is easy. Print off you image or words using a laser printer. If you want the image to face a certain direction (especially needed for text), you need to flip the image before printing. See notes above for more information about choosing an image. 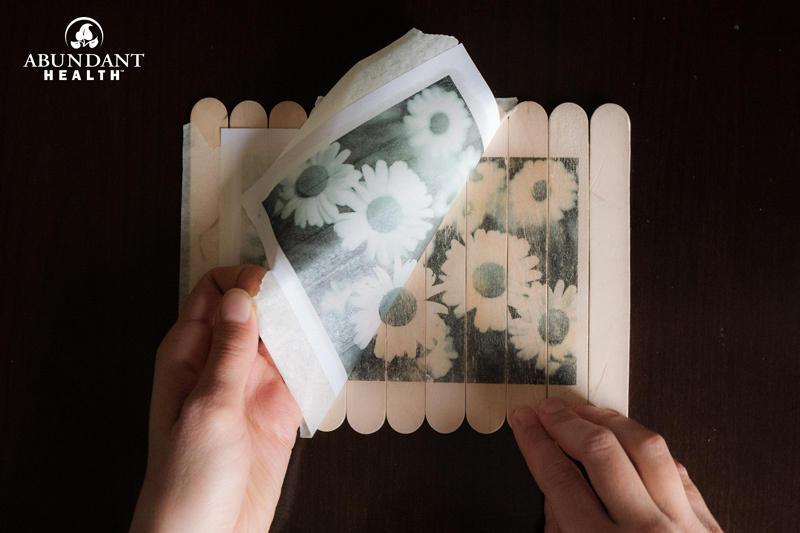 Line up your popsicle sticks (enough to cover the image you are transferring). We used 9 popsicle sticks + 2 extra to help tape the image down for a 4×6 image. Tape the sticks together; then flip the set over. Cut the image from the paper, leaving a 1/4 inch border to allow you to tape around the edges. Tape the image to the popsicle sticks with the ink side facing down. Place 10–15 drops of orange essential oil in the glass shot glass. 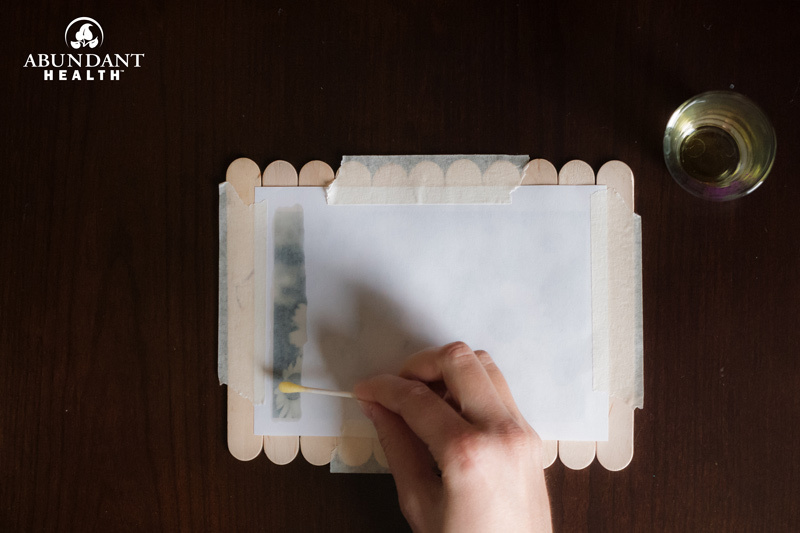 Dip a cotton swab into the orange oil, and then swab the oil over the back of the printed design a little at a time (the design will become visible through the paper as you swab the oil over it). We found it best to do one popsicle stick at a time. Use an extra popsicle stick to rub completely over the back of the printed design. This presses the toner into the wood, so you need to be fairly firm; but don’t press down so hard that you tear through the paper. Be certain to rub over all parts of the design. We found it worked best to spread oil over one popsicle stick, rub with the extra stick, and repeat on the next popsicle stick. Continue to repeat these two steps until the entire image has been transferred. Once you are done, carefully peel back one corner or side of the design to ensure you didn’t miss transferring any part of it. If you did, carefully replace the paper in the same spot, and rub over the missing areas to transfer them. 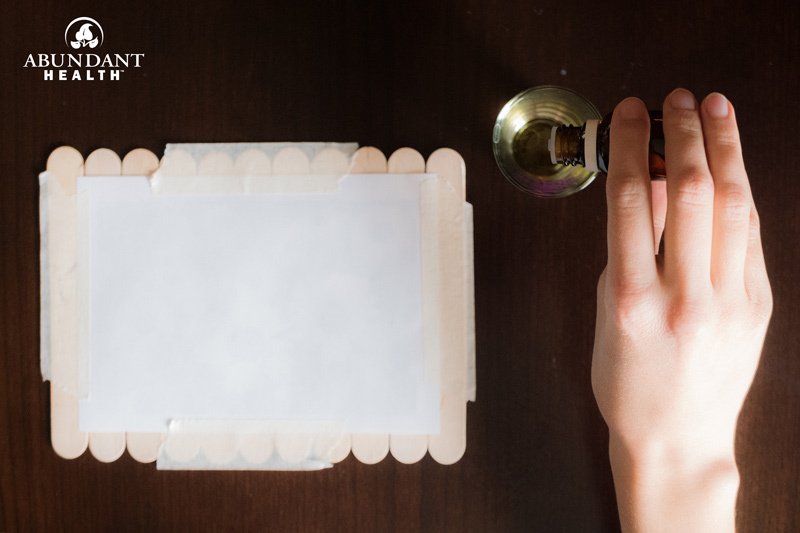 When finished, remove the paper and tape from the popsicle sticks. 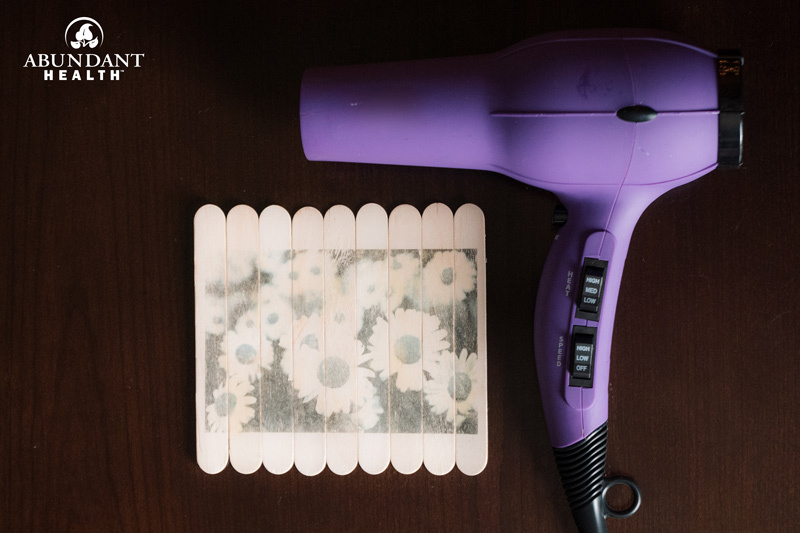 Use a blow dryer on its hottest setting to blow hot air over the design to help fuse it into the wood (this helps prevent the design from fading or getting ink on your fingers). Once dry, flip the puzzle over, and remove the tape on the back. Now you can mix up the pieces and try putting them back together again! Drill a small hole in the top of each popsicle stick, and attach all the pieces to a ring. This helps keep the puzzle pieces together when not in use. If the puzzle is a little difficult to figure out on it’s own, print off an extra image to use as a reference. Place the image and all pieces in a bag so everything stays together when not in use.